Most banks and building societies issuing new 'chip and pin' credit cards are unaware of the needs of disabled customers according to research carried out by the Royal National Institute for the Blind. The new cards will replace existing credit and debit cards with a more secure system that requires people to enter a personal identification number by using a keypad. They will be difficult to use by some people with visual impairments, people who have difficulty with manual dexterity and those who are unable to memorise numbers. Issuing institutions have agreed that anyone who has difficulty with a chip and pin card will have the option of using their signature instead. Since this facility will have to be programmed onto the card, the RNIB says that call centre staff need to be aware of this difference. It conducted a mystery telephone shopping exercise at the beginning of April which found that more than two-thirds of callers were given misleading, inaccurate or, in some cases, no information on the choice between chip and pin and chip and signature cards. "RNIB believes that blind and partially sighted customers should be better informed by their card issuers about the choice they have," said spokesman, Bill Alker. "We advise people with sight problems to speak with their card providers sooner rather than later." 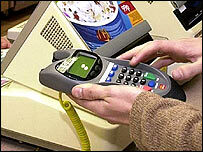 Chip and Pin - the organisation set up to launch the new technology - says it is taking the RNIB's findings "seriously". "We are working hard to try and improve the accuracy of the information people get from their call centres," said Sandra Quinn, a Chip and Pin spokesperson. "But this is a huge training job - we need to ensure that more than 200,000 staff are retrained over time." Chip and Pin has conducted its own research among disabled people which, it says, shows that the majority welcome the new system. 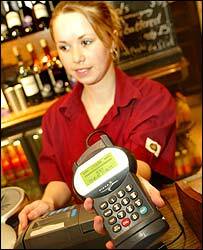 Its findings are based on responses from 350 disabled and elderly cardholders in 11 locations around the UK. More than 80 percent were happy to use the new system including 27 out of 29 visually impaired cardholders interviewed. But the RNIB's concerns relate to people who know - or think they know - that they will experience problems with chip and pin cards. It says card issuers must provide customers with the option to continue to use their signature to authorise purchases. The mystery shopping exercise will be repeated in July, but this time the RNIB is threatening to name the worst offenders.